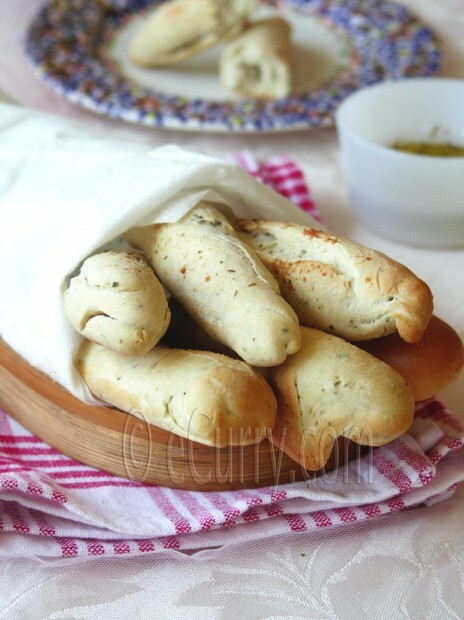 Fresh baked breadsticks with Italian flavors; crusty on the outside and soft and tender inside. They will be gone the moment they come out of the oven! Another recipe which sat in the draft unattended, half cooked. All of a sudden my spirit to cook and blog has disappeared. It could be the heat or the beginning of the summer break and the desire that comes with it to laze around and spend a zillion memorable moments with the kids or the plain fact that I feel like eating only fresh fruits and berries and salads. I don’t know…I had thought the break I took would do me good, but at the back of the mind that fear lingered that once I lost touch I would not be able to get back again. The half written posts are annoying, the pictures amiss and the proportions and ingredients quite a muddle in my head. It takes a longer time to put everything together. Well, here I am with nothing else but some w(h)ine and bread sticks which were made the first place after I craved the Olive Garden’s Antipasto & Zuppa; the bread sticks and the minestrone soup which we get for ourselves every single time. These were not exactly the Olive Garden kind; not as soft topped, but crusty on the outside and gentle and hollow on the inside just the way I like my breads. Rustic, fresh, and warm. I am not fond of bread except when I make them at home and then they don’t last too long. 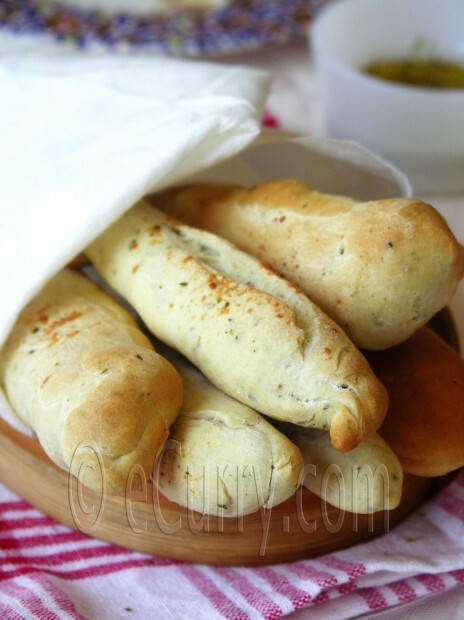 Notes: Use olives, sun dried tomatoes, peppers etc to have breadsticks with different flavors. Combine all ingredients for the topping in a bowl and set aside. Take 1/4 cup warm water in the bowl; dissolve half the sugar and sprinkle in the yeast and set aside until foamy, about 5 minutes. Combine the flour, butter, olive oil, garlic powder, powdered herbs, rest of the sugar and salt and mix till the flour mixture gets crumbly. Add the frothy yeast mix and combine everything together, while slowly adding some warm water to make a soft but NOT sticky dough. Knead the dough by hand on a floured surface until very smooth and soft. Roll into a long log; divide into the number of rolls you want to make (calculate the number by how big you want the sticks to be). Knead each piece slightly and shape into a breadstick; arrange 2 inches apart on a parchment-lined baking sheet. Cover with a cloth; let rise in a warm spot until almost doubled, about an hour. Brush the breadsticks with the prepared topping and sprinkle some coarse salt. Lightly cover and let it rise for another half an hour. Bake until slightly golden, about 15-20 minutes or until very light golden. If desired, brush the warm breadsticks with the topping mix. Serve warm. Tastes best when served immediately. Serve with soup or just by themselves with some herbed olive oil on the side. Perfect looking breadsticks Soma! Egulo ki khub choto sizer hoye? Mone hoye na … jodi ota ekta dinner plate hoye. 😉 Thats what keeps me going. thank you! they were the size of the palm – as long. The plate is a small side plate. Darun korte gechilam.. LOL kintu besh hiji biji hoye gelo painting ta. came out nothing like what I had envisioned, took quite a different path during the process. Bread sticks are great to dip in soups, looks delicious. Looks so so perfect and yumm, i can imagine the aroma when you bake them. Soma, guest ra chole gechen ? Phewwwww !!! Mmm, I can’t wait to try these breadsticks! I was planning on making Tomato Tortellini soup on Friday night, these will be a perfect accompaniment. these breadsticks are the love of my life..I go to every Italian restuarant ,order something huge,finish these things within 2 mins they come and give impression to people there that I am from Somalia and then wont finish my main course..Same story all d time..now getting those cravings again..I want it with balsamic NOW..!! Definitely making this one. Easy enough for a bad baker like me :)! These breadsticks look perfect! I love Italian breadsticks — they are so comforting. I can just imagine how delicious your house smelled while baking these! Great looking bread sticks. I can’t stop eating them. Wonderful breadsticks!! They’re so addictive!! Stunning..you are so talented..WOW! Breadsticks look awesome..beautifully baked! Those bread sticks look amazing. I am going to have to make them the next time I make pasta. I love bread! yum fresh home made bread stick & that too on self painted plate…..wah kya baat hai…. 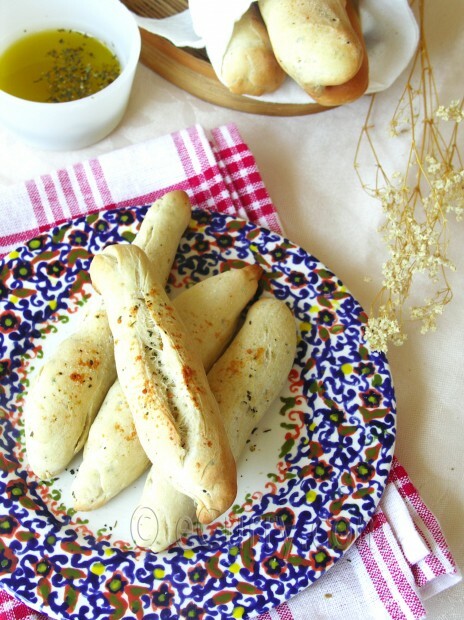 Freshly baked breadsticks sound so wonderful! Yum! btw, I’m hosting a Magic Bullet giveaway on my blog, and it’d be great if you could participate!